Posted by Qrystal on August 11, 2008 at 14:51. Category: Tools. Tags: planning, thesis, time management. I recently discovered LiquidPlanner, a project planner based on a unique concept: that plans are meant to be fluid, and that nothing can be planned with exact certainty. With normal planning software, this fluidity causes the need to replan and tweak and fiddle… and in my case, my tendency towards optimism resulted in me letting myself down with every “deadline” I invented for myself. 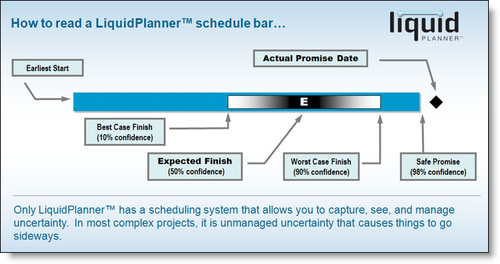 LiquidPlanner is different: I have one target date for completion of the entire project, and each part of the project has an estimated range for when it might be completed. Harmony between optimism and realism?! Believe it!